Ergonomics, meet sophistication. The Raynor Ergohuman Chair - Leather Chair with Headrest is the stylish new seat that will keep you working for hours without a pause. Push your productivity and work to new heights as you upgrade your workstation with this classic black leather chair complete with cranium-cradling headrest. The Raynor Ergohuman Chair model LE9ERG with leather seat and back offers all of the best features you'd want in an ergo-friendly seat like that of the Ergohuman Chair, except that instead of mesh back, you get the added support of padded, upholstered cushions covered in luxurious black leather. 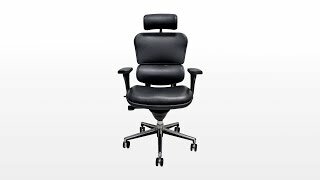 Adjustable headrest and pivoting armrests round out the standard characteristics of this high-end ergonomic office chair, giving you a comprehensive seating solution that you actually want to work in, leading to more productive and comfortable work overall. My husband used an executive chair at his office and at his home office but always complained about lower back pain. I purchased this chair and he loved it. No more pain! He liked it so much I purchased a second one for the house. It makes such a difference to sit in a ergonomically correct chair. ErgoHuman and this Chair absolutely ROCK!! Seriously!! Not only is this ErgoHuman chair (All Leather High Back Chair w/ Headrest) a perfect fit for my bad back (3 herniated disks, 1 badly ruptured and surgically repaired with numerous nerve damage complications), but it turns out it's also a fantastic investment! It comes with a Lifetime Guarantee, which I can vouch for 100%!! I bought this chair back in 2008, and I'm about 270-lbs (give or take). I have been using this chair regularly for almost 8 years in my home office / editing bay. I also drag it into my living room anytime I need to work on my home theater setup. So this wonderful chair gets a lot of regular use from a relatively big guy. And gentleness is not exactly one of my better traits. Point being, it took nearly 8 years but the wheels have finally started giving up. 2 of them recently broke, so I called ErgoHuman to find out how much the replacement wheels would cost me. Much to my surprise they were happy to ship me all 5 new wheel assemblies ...for FREE! And as incredible as that is, the moment that really blew my mind was that a human being who was an absolute pleasure to speak with answered the phone when I called. Well, there was an initial prompt to select 1 for Sales and Support. But after pushing the 1 on my phone, a human being answered almost immediately! I mean wow, that's pretty rare nowadays, right? So I'm spending the rest of this week introducing myself to people to rave about ErgoHuman! ...because they ROCK!! Seriously!! As a software developer in a production environment, I spend long hours sitting at my computer, day and night. Nagging low back pain and sciatica had become just a part of my life. My Dr. suggested my chair may be part of my problem, so the hunt was on. I settled on the Ergohuman and the difference has been amazing! Pretty much no pain anymore, no matter how long the hours. I absolutely recommend this chair. After getting the chair adjusted to the right place, this is by far the most comfortable office chair I have sat in. At first I thought maybe it was too stiff or too straight up. But, once it's all configured to your body, you can't go wrong. The only thing I would change is the stiffness on the recline. This is a GREAT chair. After a round of physical therapy for my shoulder & upper back, I conceded that my office chair was likely to blame. I had a big, leather Lane which is a beautiful chair, but it didn't fit me one bit. After researching chairs online for hours, I decided on the Raynor Ergohuman. The adjustability of this chair is just what I was looking for. It's also very solid and appears well made. As a plus, I got a free webinar with my purchase for an ergonomic training seminar. I highly recommend that--it was very informative. All-in-all, I'm very pleased with this chair. No more shoulder or neck pain, even on the days that I spend 8 hours in this chair. Once I got everything adjusted so it was just right, I haven't had to do any more tweaking. It's a definite 5-stars in my book! Worth every penny. I suffer chronic lower back pain and my Aeron no longer cuts the mustard. I sit for hours pain-free in the Raynor -- it is the most comfortable office chair I have ever used. And in full recline position, it's like relaxing in a dentist's chair! I have spine problems from my neck to my tail bone. This chair actually makes sitting at a computer a relief. I am able to work more comfortably and longer. The only negative is that I would prefer that the seat recline with the back. Edited to add: The seat does recline w/back in 2 to 1 ratio. It sounds like you would have been happier with a knee tilt mechanism which this chair does not have. I love this chair and would sleep in it if I could. I just had my shoulder replaced and was worried about sitting at my desk again. This chair allows me to set the arms at keyboard height and takes everything off of my shoulder. I have been using this chair now for about a month and absolutely love it! I am a software developer and sit in my chair around 9 hours a day. My lower back was starting to hurt when sitting in my old chair. Now that I have this Ergohuman full leather high back chair my back pain has gone away completely. It takes a couple of days to get used to, but after a couple of days with it, you will find all other chairs uncomfortable. The polished aluminum parts look amazing. I have not had any problems with mine, and if I do this chair has a great warranty. Love it. $724.00 List Price: $1,363.00* The list price is the same as the MSRP (Manufacturer's Suggested Retail Price). It may not necessarily be the price at which the product is sold.